In the past few months, the new ‘Africa RISING’ (Africa Research in Sustainable Intensification for the Next Generation) program has emerged from a process of discussion and consultation – adapting design and thinking along the way – and engaging a wide range of stakeholders. More information on the Program. In October 2011, a team from the United States’ Agency for International Development (USAID) met with with project teams from the International Institute for Tropical Agriculture (IITA) and the International Livestock Research Institute (ILRI) and other partners to define priority directions for three linked projects intended to ‘sustainably intensify key African farming systems.’ Following these initial meetings, the project coordinators decided to organize a series of ‘design workshops’ – in Ghana, Ethiopia and Tanzania – to plan specific activities in each of the three regions (West Africa, Ethiopian Highlands, East and Southern Africa). The idea behind each of the design workshops (in Tamale 9-12 January, Addis Ababa 30 January-2 February, Dar es Salaam 6-9 February) was to review the broad agenda of the program with a wide range of stakeholders in the first two days and then to finalize some project details with a more limited group in the last two days. Starting off in Ghana, the project design changed much since early January. The events effectively became a series of think-, work- and write-shops reinforcing and building upon each other. Approaches to communication, learning and knowledge management. Each region’s concept note was reviewed. In particular the major assumptions or hypotheses guiding each of the regional concept notes, as well as the intended high level outcomes informing the vision were debated and refined. Issues getting greater attention included nutrition, gender and the importance of quantitative targets; great emphasis was given to better alignment with sectoral goals of Governments as well as the priorities of funders. The program now has aligned its overall targets, purpose, objectives and intended outcomes. Discussions in the Tamale workshop made it clear that the various projects need to commit themselves to achieve ambitious goals, targets and outcomes. Further, that these need to be ‘developmental’, not limited to what research alone could produce. It was agreed that close alignment and strong linkages with other actors are critical and would need to be part of the design of the Program. This alignment was at several levels: With the priority actions identified by governments in their CAADP processes; with the investment priorities of different donors active in a country; with the efforts of national and local research, civil society and private sector groups; and between the CGIAR centers and the others. 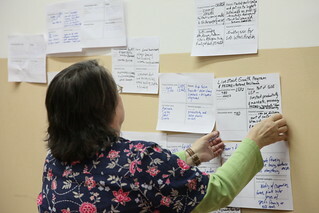 In each of the workshops, existing efforts and partners were identified to work with. Site selection. In all the workshops this was a challenging issue. With data and support from the International Food Policy Research Institute (IFPRI), participants in each workshop identified a few promising sites in each country. Alongside the initial work on so-called ‘early wins’, the projects also embarked on a process to identify research sites for the upcoming 4 years of research (2012-2015 or so). Early or ‘quick’ wins. Early in the first workshop in Ghana, it became clear that the projects would need to identify promising research interventions with results that could be realized by September 2012 (a short period). After various iterations, a call for early win proposals was circulated in late February. The results will be known in late March or early April. The criteria to assess these proposals included: integration across farming systems, following the priorities of USAID country missions, involving at least three organizations including one CGIAR center and preferably national institutions. The initial concept was for three separate research projects. It quickly emerged in the first workshop that a coherent research design approach or framework across the three would be very useful. The initial basic idea was extended in the Addis Ababa workshop and brought together in Dar es Salaam with a team identified to work on a very initial Program-wide research framework within which the regional projects would operate. Getting agreement on coordination and management mechanisms was a key part of the agenda from the very beginning and each project put together its own steering committee to ensure efficient management and alignment to the efforts of other partners. Alongside the emergence of a common Program-wide research framework, participants also agreed that a light Program-wide coordination team was needed – to foster learning and communication and ensure higher level consistency in the research. Alongside the three research projects, USAID commissioned a team from IFPRI to work with each prohect – and now the Program as a whole – on monitoring and evaluation. The team played a large role in site selection, mapping various ongoing initiatives, and working with the projects on intended research and development outcomes and indicators. A good introduction to this component is in the presentation by Stan Wood to the Tanzania workshop. Finally, as a result of various interactions, communication, learning and knowledge management also came to the fore as a crucial ‘glue’ to ensure strong cooperation and coordination across all institutes, partners and countries involved. 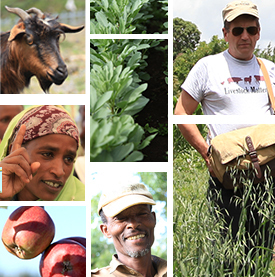 Each of the regional projects is expected to work on these issues in their specific situations, ILRI will take the lead in facilitating Program-wide activities of this kind. These workshops were intended to strongly inform and improve the design and operationalization of the Program across its three regional projects. The discussions from each workshop are documented on the program wiki, we intend that subsequent activities will also be captured and shared there … or on this web site. This post was written by Ewen Le Borgne with inputs from Peter Ballantyne. Tags: africa rising, Feed the Future, USAID. Bookmark the permalink. Fabulous communications! Thanks for keeping me abreast of what is going on. And I love the new name you all came up with for this Feed the Future initiative—‘Africa RISING’!